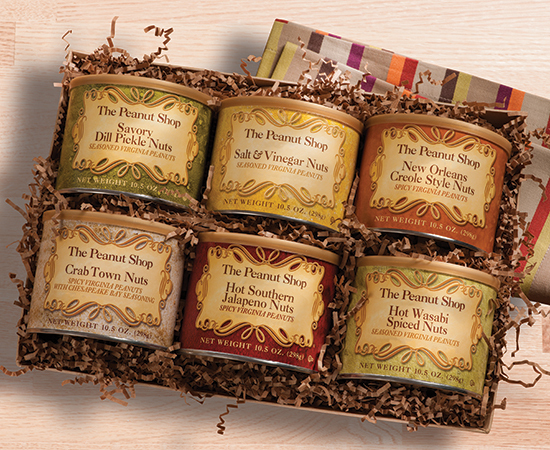 Six savory seasoned nuts for the spicy lover! Spicy Peanut Sampler Crab Town Nuts, Hot Southern Nuts, Savory Dill Pickle Nuts, Hot Wasabi Nuts, Salt & Vinegar Nuts, and New Orleans Creole Nuts. 6 – 10.5 oz. tins in a nifty gift tray. So Hot and So Good! I first tried 'em at Dog Street Pub. They have a blend of the spicy nuts. Boy, the beers and nuts were a beautiful marriage. The nuts are hot and filled with so many wonderful flavors. I'm hooked! I love these nuts, I love the spicy seasonings. It would be nice if you bottled the seasonings for these habanero nuts and sold it to customers.